Forum Index > Off-topic Talk > Western "daisho"? Posted: Wed 02 Jul, 2014 8:28 pm Post subject: Western "daisho"? Has anyone paired an Albion Talhoffer with the Constable to make a matched set? I just noticed the near matched furniture and blade. I'd like to to see that, if anyone's paired them. Posted: Thu 03 Jul, 2014 2:27 am Post subject: Western "daisho"? I also noticed that both swords are nearly similar except that there's also a brown-hilted Constable. While they are indeed similar, one would think that two sword-length blades might be a bit much to carry around. The daisho was more often than not a katana or tachi and a tanto, rather than a wakizashi, which is IIRC a modernism (the pairing, that is, not the actual blade). My thought was to match The Talhoffer with The Lancaster. What would go with my Fiore? A Poitiers? 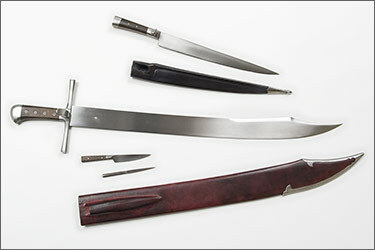 Well far be it from me to dissuade anyone from buying two swords rather than one, but a real "western daisho" would be closer to something like these: http://www.arms-n-armor.com/sets.html, both in time period and in style of swords. Exactly what Jeffrey said above. That being said, you might as well buy two swords for any reason! Even if it would be difficult to use two longswords/hand-and-a-half swords with each hand. How about the Knecht and the Soldat? Or, if you prefer, a Soldat and companion bauernwehr, or Soldat and by-knife? The Baron and the Knight would make a nice matched pair too. 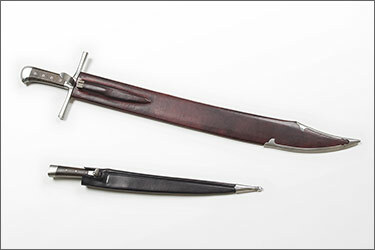 And since seeing that beautiful Katzbalger in the makers forum, I've been fantasizing about a matched zweihander and katzbalger combo. I think I've seen some big twohanders with the figure-eight shaped guard like a katzbalger, so I think it could be done really nicely. The Poiters and the Agincourt would make a very similar pairing. Nathan, that is exquisite. Do you have suspension set for those? No. I have no use for such things since I don't wear them. Also, there wouldn't be an integrated suspension for this type of weapon but it rather be tied to/strapped a belt. You can see the back of the scabbard here. It just has channels for a simple thong. The ends are tucked into itself to keep them out of the way.